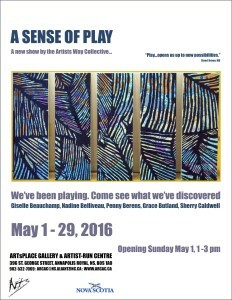 SOFAAR members Penny Berens, Grace Butland and Sherry Caldwell along with Giselle Beauchamp and Nadine Belliveau have a new exhibit opening up at ARCAC in Annapolis Royal this Sunday May 1st. The opening reception is from 1 to 3 pm. The exhibit runs until May 29th. The SOFAAR Board is busily planning the official “launch” of the organization and we invite your participation as a member. We’ve planned the event for Friday, June 3 and Saturday, June 4. The dates coincide with Annapolis Royal’s First Friday celebrations and Saturday Farmers & Traders Market. The purpose of the event is to introduce the Society of Fibre Artists of the Annapolis River to the public; to call attention to fibre art in all its forms; to recruit some new members; and to provide a networking opportunity for our current members. For the program, we will display a variety of fibre art created by our current members. There will be a schedule of speakers to allow those members who so choose to give a short (around 5 minutes) talk about their work and interact with the audience. Between the talks, members and visitors can mingle, check out all the work on display, ask questions, etc. Simply attending and enjoying the work of fellow members. If at all possible, work should be displayed both Friday night and Saturday. If you want to talk about your work, you can choose either Friday night, Saturday, or both. As soon as we know how many people want to speak, we’ll work out a schedule for speaking. We’ll determine how much work each person can bring based on space restrictions of the hall, and we’ll work out a schedule for delivery and set-up once we have confirmed the participants. June 4, 10 a.m. – 2 p.m.
You must be a member of SOFAAR to participate. To become a member, please see our ‘membership’ page. If you would like to participate either by display or display and speaking, please contact Marilyn Preus at silkjourney@ns.sympatico.ca no later than April 30 and let her know the type of fibre work you will bring, if you plan to give a talk or just display, and which date you would prefer to talk, if applicable. SOFAAR’s board is now busy planning our launch event in June. We will be having a members’ show on Friday, June 3rd and Saturday, June 4th at St. Luke’s Paris Hall in Annapolis Royal. This show will be part of the many activities that happen on the First Friday of every month in Annapolis Royal between June and October. An initiative of the Annapolis Board of Trade (ABoT), First Fridays encourage community members to come out and experience the town. Stores are open till 9 pm, activities are organized at the market place and at different venues. SOFAAR is proud to be a member of ABoT and to be a part of the 2016’s first First Friday event. This exhibit is open to all members of SOFAAR. Members will be able to display a piece in the show and, if they wish, they will be able to talk about their piece at a specific time on either the Friday night or the Saturday. The public will be encouraged to browse the exhibit and listen to the fibre artists talk about their piece. Our new brochures will be available as well as the list of our sponsors.